THX to OntheWater102, I made my own chatterbait. Post subject: THX to OntheWater102, I made my own chatterbait. A week ago, after again re-reading OnTheWater102's Chatterbait primer, I ordered ten blades on Ebay. They were a bit more expensive than the primer's blade, but ten bucks for ten of them was OK with me. My first results are shown below. I took some license with the arrangement due to the size of the split ring that I had available. She seemed to work well in my pond test. It cast a mile; buzzed when retrieve with a nice, intermittent stutter. Best thing may be, due to the small-sized blade, is that the swimbait rose to the surface when I cranked too fast. I almost always fish too fast. This lure may slow me down. p.s. 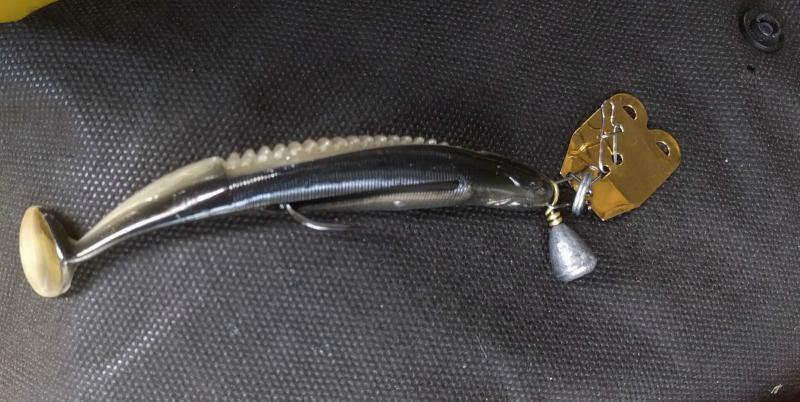 OnTheWater102's Chatterbait Primer is here. Awesome! What will you be building next? Now lets see some fish! I was going to give it a try this morning, but I've come down with the first cold that I've had in two or three years. Just babying it for now. Lots of football to watch on tv today.